My life is my playground! I am willing to mess up! Willing to experiment! Willing to try stuff and figure out if it works for me! Don’t get me wrong—I don’t enjoy making mistakes; I don’t intentionally screw something up. Quite the contrary: I give my best, I give my all; I do what I can, do what I must…and then, if a mistake comes up, I know it was a mistake. I can then look back over my intentions, my process, and my actions and figure out what happened, and how to correct it. If you mess up, make it count! Mistakes happen. They do. There is no reason to be fearful or timid or cautious. Mistakes are an argument for being bold and courageous! Give me life experiments! Give me my growing pains! Give me surprises! Give me mystery! Give me ups! Give me downs! Give me questions and problems and challenges! Stretch me to my limits so when I return to normal, my normal is never the same! Expand my mind! Open my heart! Challenge my thoughts! Question my beliefs! Yes, do! Cloak yourself with awareness, figure out who you are, try yourself on for size, then try someone else’s self on for size and see how that feels. Take from others what feels like a good addition to you, and expand your sense of who you are. Integrating more and more and more of people and experiences, expands your ability to move through situations and experiences with ease. I want to grow. I want to learn. I want to know everything I can know. I want to experience all life contains. Have you ever looked around you and thought, “There is so much here! I need to hustle if I am going to take it all in!” Maybe at Disney World – but, if at a constructed playground, why not life’s playground? What is the difference? There is wonder and amusement at those constructed fantasy worlds to entertain people who can’t find wonder and amusement in life. Find it here, and you won’t need to find it there. But asking for wonder and surprises and growth is scary, too, isn’t it? That’s because life gives it to you. Life will give you as much as you ask for. The choice is yours: grow, live, learn, gain insight, be challenged, stretch, experiment…or… not. 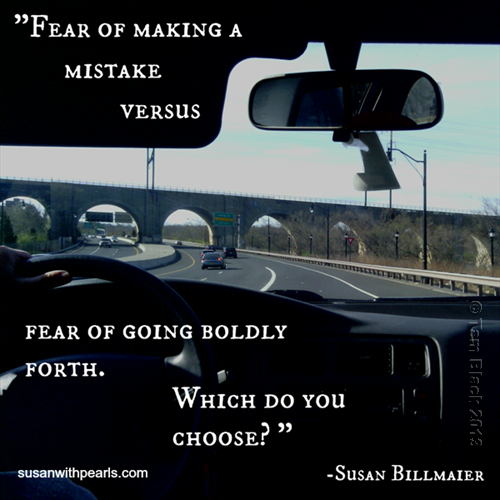 Fear of making a mistake versus fear of going boldly forth. Which do you choose? Life is its own reward.